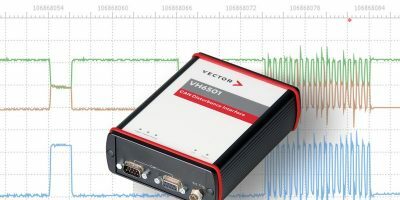 Hardware for the precise and reproducible disturbance of CAN-FD networks is available from Vector. The compact VH6501 is also a network interface for CANoe. This combination of disturbance functionality and interface enables test setups for conformance testing with very little effort, says Vector. The VH6501 hardware allows test engineers and developers to produce a variety of digital and analogue disturbances precisely and reproducibly in CAN-FD networks. It can be used to automatically test the error handling of engine control units (ECUs), which are part of the automotive industry’s conformity tests. The VH6501 serves the test tool CANoe as a normal network interface while the fault functionality is controlled via the programming language Communication Access Programming Language (CAPL) integrated in CANoe. This close association means that test set-ups with residual bus simulation can be realised very easily and without additional hardware, says Vector. The CAPL application program interface (API) allows users to configure short circuits in the CAN signal lines, interchanging cables, and modifying R/C network parameters for analogue interference. In the case of digital disturbances, almost any digital interference sequences and extensive triggering conditions can be defined. The VH6501 covers more than just typical use cases, such as checking the controller behaviour during a bus-off or measuring the sampling time. The exact visual representation of the disturbances generated by VH6501 and that of the reactions in the CAN-FD network can be done with the software CANoe scope and the necessary hardware. According to Vector, this allows accurate analysis of the events and helps VH6501 users to create their own tests. Vector Informatik manufactures software tools and embedded components for the development of electronic systems and their networking with many different systems from CAN to automotive Ethernet. Vector has been a partner of automotive manufacturers and suppliers and related industries since 1988. Vector tools and services are used by companies in the automotive, commercial vehicles, aerospace, transportation, and control technology industries. Vector currently employs more than 2,000 people worldwide, with headquarters in Germany (Stuttgart), and subsidiaries in the USA, Japan, France, Great Britain, Italy, Austria, Sweden, South Korea, India, China, and Brazil.